Collage was the first medium in the twentieth century to challenge the sanctity of the age-old forms of painting and sculpture. Derived from the French word "coller" (to glue), collage uses bits of torn and cut paper, sometimes taken from trash, to create a sense of dislocation, experimentation, irony and often, great beauty. Unlike oil paintings on canvas or panel, or sculptures in marble or bronze, collages have an inherent quality of transience and fragility. This exhibition presented approximately 50 collages by a diverse range of European and American artists to demonstrate the medium's broad and surprising power, including works by: Jean Arp, Romare Bearden, Ethel Camhi, Joseph Cornell, Salvador Dali, Hunt Diederich, John Digby, Steven Ford, Albert Gallatin, George Grosz, Jane Hammond, Hannah Hoch, Ray Johnson, Jiri Kolar, Roy Lichtentstein, Conrad Marca-Relli, Frank Olt, Peter Pitzele, Marybeth Rothman, Miriam Schapiro, Nancy Scheinman, Esphyr Slobodkina, Casey Vogt, and Mark Wagner. Among the various art forms invoked were Victoriana, Cubism, Dada, Surrealism, Conceptual Art, Abstraction, Abstract Expressionism, Pop Art, Feminism, the African-American experience, and Currency Art. 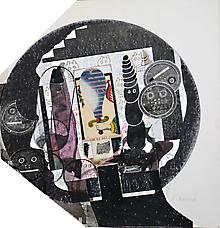 Ripped: The Allure of Collage was organized by guest curator Kenneth Wayne, Ph.D.